It's in my head. The Leadville 100 is 10 days away. It's all I can think about. I'm starting to lose sleep. Not only that but I find myself doing silly things like washing my hands several times per day or not letting my kids drink out of my Diet Coke cuz you know, what if they have a cold or something? The last thing I want is to get sick the week of the race. I weigh myself twice per day. Every pound can help. I'm down to 163 lbs as of this morning. Lately when I ride, I find myself taking it slow on the downhill. Just last week both Sam and Dug crashed and are nursing injuries. I don't need that. I know I should relax and not worry as much but I can't. Having trained for this one ride all year, I want to be sure I can put in a good effort. I've never been this worried about a stupid ride. I don't like it. I want it all to be over. Is it normal to dedicate an entire room in your house to cycling? About a month ago Rachelle and I decided to finally finish our basement. It should be done by the end of this week (Note: I didn't do any of the work myself which is why it has only taken 3-4 weeks). One of the requirements for me was to have a bike/gear room where I can store all my stuff. It's not a big room and it isn't fancy but its a spot to have all my bike gear in one place. No more digging through my sons's closet to find the other arm wamer which is part of his ninja outfit, or looking in Rachelle's drawer for my favorite jersey which happens to be pink (probably explains why it ends up in her stuff). I can finally have one room to keep it all together. It may not seem like a big deal but I'm pretty excited about it. It's only a matter of time before I crash into one of the walls when I ride my rollers this winter. (And when I do, Rachelle will there with her camera) But that's okay. It's a cycling room and that stuff is supposed to happen. Sam, you make us all proud and full of envy. With only 3 weeks left until Leadville, It's too late for the rest of us to pull this off. Just do me a favor and stay away from my wife when we are out there. She has a weakness for dudes with a dirty upper lip. A while ago, I posted a sneak peak of a jersey design that Salt Cycling put together (a side project). There are a lot of single speed 29er riders out there. Just go to the local race and check out the bikes. More and more 29ers and single speeds are showing up. And not just showing up but taking podium spots. Brad, Kenny, Jamie P., the Holley family , are all perfect examples of this. We felt it was time there was a jersey that represented what that scene is about. The Salt Cycling site is almost finsihed and will hopefully be up by early next week to accept orders. 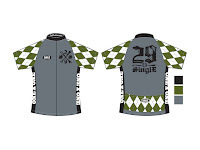 The SS 29er jersey is just the first of several we have on tap so be sure to check out the site often. We guarantee that our jersey's will make you 5% lighter, 10% faster, and .01% sexier. (Results may vary). You know it's a good ride when someone throws up on the climb. This morning, 4 of us from work met at the bottom of Suncrest (North side), and rode our bikes into work. Its about a 23 mile commute if we do the Suncrest climb. In the past I commuted for training miles but now I commute to avoid the high gas prices. It's out of control. I can't bring myself to fill up the truck all the way. As soon as the pump reads $50, I shut it off and call it good. The climb up Suncrest started out a solid pace (no warm up whatsoever). Rico put the hammer down, then Dave decided to pass him, and the pace got faster and faster as we got closer to top. So fast, in fact, one of the guys (Rico) lost his breakfast on the side of the road....nice. By the time we got to the top, it was clear this was not going to be a friendly social ride into work. As soon as we all dropped down the South side into Alpine, the pace kicked back up and heart rates spiked. It was pretty much a 15 mile sprint into work at that point. Since we don't ride a lot together, the Alpha male has not been established and that means it's going to hurt until we figure it out. After the ride, Dave and I paid $7 for all you can eat french toast at the local Kneaders. Sooooo good. Yesterday was the PC Perfect 10 Race. About 150 riders were there. I showed up with a plan to ride in the solo group and log some training miles for the upcoming Leadville race. I didn't plan to stay the entire time and I wasn't interested in going race pace. This turned out to be a good plan since I didn't have the legs I thought I would. I rode for about 6.5 hours and logged 8 laps and then packed up and cruised home to hang with my family the rest of the day. I'm glad I wasn't in it for the entire 10 hours. I was starting to get sloppy and very tired of the same climb over and over again. These events are more mental than anything. Tony and Trent were the only other DNA riders there. Trent had major bike issues and pulled the plug early into the race. Tony seemed like he could have kept riding and showed no signs of slowing down but stopped early to get home, and in his words, "stay married". I've said this before but my friends are fast. It's scary really. This Saturday is the Park City Perfect 10 race. Complete as many laps in the 10 hours as you can. Each lap is about 7 miles with 900 ft of vertical. There are options for Solo, Duo, or 4 person teams. I signed up for the solo. The course looks great. It's actually on the Deer Valley resort. Part of the climb includes the Team Big Bear route which is really a fun climb. (I'm not sure how fun this will be after a few laps). My plan is to do this and log some long training miles on dirt and not treat it as a race. In fact, I doubt I'll ride the entire 10 hours. I'm going to pack a cooler full of water, Carbo Rocket, and Diet Coke. Have a stash of PB & honey sandwiches, and some soup, a chair and hopefully some sort of tent for shade and see how long I can ride. It will be fun in a very painful way. The Leadville 100 race is about 4 weeks away. It's starting to get into my head. Check out this clip on youtube of the start. 1,000 cyclists all working for position before the road turns to dirt and gets narrow. It's by far the sketchiest start I've ever been in and the most stressful part of the race. On Saturday a few of us (Dug, Elden, Sam, Lisa and Ann) went for a training ride up and over the Nebo Loop. We met at Racer's in Provo at 5:30am. Riding from Provo made the total distance about 100 miles and I'm guessing about 7,000 ft of vertical (I don't ride with a bike computer and end up getting most of my stats from other riders but I think this is pretty accurate). We got an early start which helped keep things cool for the big climb. The group was a good size and we were able to keep a steady pace for the entire ride. We stopped in Nephi for some lunch at Wendy's. I ordered a 44oz Diet Coke, a chocolate frosty, and a Jr. Cheeseburger. It was just enough food to get me through the last 40 miles back to Provo. I like road biking for the simple fact that you can throw a debit card or a little cash in your jersey and pick up food and drink along the way. I need a couple more big rides like this to make sure my legs can go the distance for Leadville. Today is Rachelle's birthday. She turns 29 (or close to it). Happy birthday Rachelle! I took the day off work to hang with her. We were lucky to have Jay take our kids for the morning so Rachelle and I could get out for a mtb ride (Thanks Jay). I brought along the flip video to capture some of the Clarks climb. I still can't get over the fact that we have mtb trails this good just outside our front door. One of my favorite things to do is ride with Rachelle. We don't get out enough together. Life is just too busy with 3 kids and a full time job. She can set a fast pace on the climbs and the heat never seems to bother her which was a good thing today since the temps spiked to 101 degrees. Check her out rounding the U turn near the top of Clarks. As I was filming this, the thought occurred to me that this might be the ticket to a faster Clarks TT for me. Let Rachelle go a few minutes ahead of me so I can chase. I guess the only problem would be if I caught her, I wouldn't want to pass. I'd like the view too much. After the ride, Rachelle cruised home to shower while I did another lap on Clarks. I met her back at the house, we jumped in the car, drove to Hagermans (sp?) and had a nice relaxing lunch together. I'm so lucky to have a wife who is so good with our kids, likes to ride, and can eat anything she wants and still stay skinny. The MS-150 was this past weekend up in Logan, UT. About 22 riders for team OMTR showed up. As a group, we raised almost $15,000. One of the top teams this year. 100 miles in 95 degree heat was just what I needed. Thanks to all who donated and helped us this year.